PROCEL standard Full declaration label including total sugars and not just “Added Sugar” (added sugar is table sugar). No artificial Colors or Flavors in line with the PROCEL brand philosophy. PROCEL’s new breakthrough flavor technology giving you the most decadent flavors seen yet. PROCEL is a Neucorp (Neulife) brand. 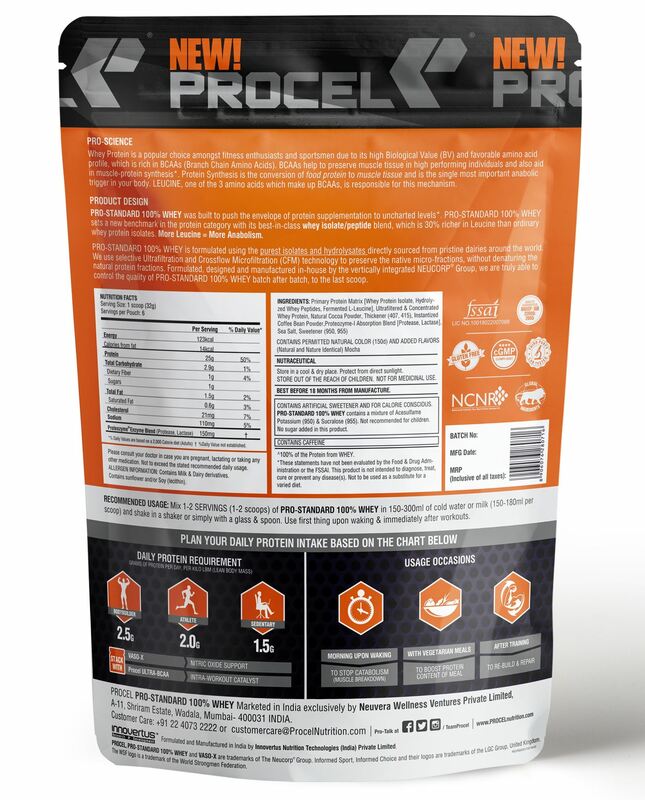 PRO-STANDARD 100% WHEY was built to push the stagnant protein category to the next level. 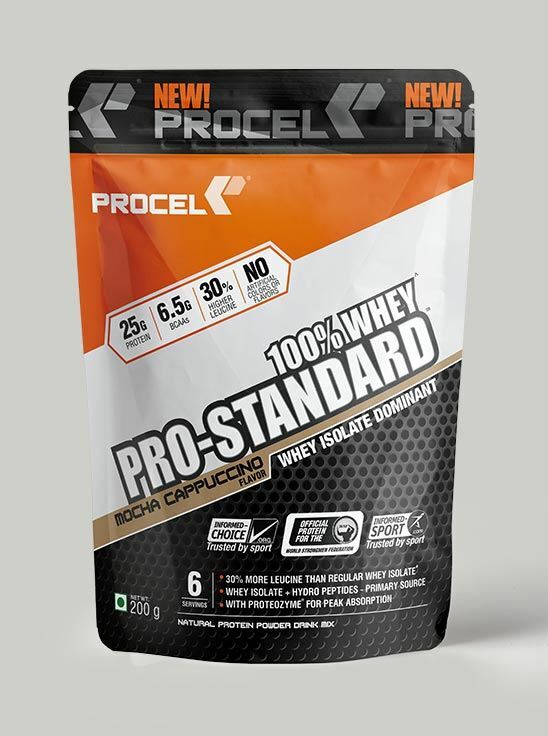 Brought to you by NEULIFE- India’s pioneering sports nutrition Company, PRO-STANDARD 100% WHEY sets a new benchmark with its best-in-class whey isolate/peptide blend, which is 30% higher in Leucine and 20% higher in BCAAs than ordinary whey protein isolates. More Leucine = More Anabolism. PRO-STANDARD 100% WHEY is formulated using the purest isolates and hydrolysates directly sourced from pristine dairies around the world. We use selective Ultrafiltration and Crossflow Microfiltration (CFM) technology to preserve the native micro-fractions, without denaturing the natural protein structure. Formulated, designed and manufactured in-house by the vertically integrated Neucorp Group, we are truly able to control the quality of PRO-STANDARD 100% WHEY batch after batch, through extensive in-house QA/QC capabilities, third-party lab testing and the industry’s only full-transparency label. Q.1 WHAT IS PRO-STANDARD 100% WHEY? PRO-STANDARD 100% WHEY disrupts the whey blends category with the industry’s first Whey Isolate + Hydro-peptide blend as its primary protein source. This protein matrix is 30% richer in Leucine than ordinary whey protein isolates. 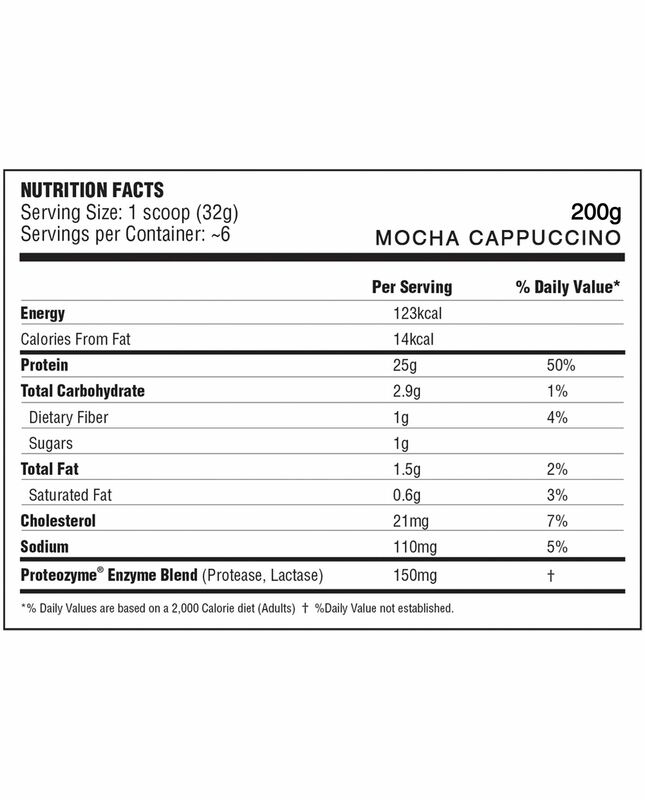 More Leucine = More Anabolism. The superlative Isolate/Peptide blend in PRO-STANDARD 100% WHEY provides 25 grams of protein in every scoop, 6.5 grams of BCAAs (20% higher than other products) and Proteozyme®-1 for Peak Absorption. PRO-STANDARD 100% WHEY contains no artificial flavors or colors. Q.2 WHAT IS WHEY ISOLATE DOMINANT? Q.3 HOW IS PRO-STANDARD 100% WHEY DIFFERENT FROM OTHER WHEY PROTEINS? Q.6 IS PRO-STANDARD 100% WHEY SUITABLE FOR CONSUMPTION FOR VEGETARIANS? Q.7 SINCE PRO-ST&ARD 100% WHEY IS A PROTEIN DERIVED FROM MILK, WHY CAN’T WE SIMPLY DRINK MILK? 2 liters of milk yields the amount of whey protein that is there in one scoop of PRO-STANDARD 100% WHEY (25 grams). The body is not equipped to handle whole foods during crucial periods like pre-workout/post-workout, early morning etc & large amount of food at a time may compromise the digestive system. At the same time, larger portion of milk increases the Lactose (milk sugar) load. Q.8 SINCE PRO-STANDARD 100% WHEY IS PROTEIN POWDER; DO I STILL NEED IT IF I EAT CHICKEN, FISH ON A DAILY BASIS? Q.9 WHAT IS THE IDEAL TIME TO CONSUME PRO-STANDARD 100% WHEY & IS IT EASY TO DIGEST? First thing in the morning & post-workout. 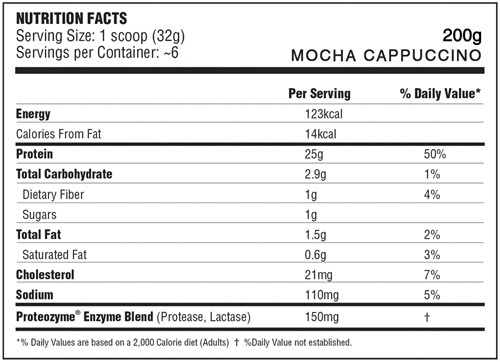 Whey can also be consumed with/in-between meals to meet up daily protein requirement. It is easy to digest. Q.10 CAN PRO-STANDARD 100% WHEY BE CONSUMED IN MILK OR WATER? Ideally have whey with water for fast absorption. Packaging was good .. Delivery was made at the right time.. No Delay .. The powder tastes really Good.. Will use it for a while and shall write the reveiw about results.